HEY TOMMY, I'M GONNA STOP AND RUN IN HERE FOR SOME ADVIL . I'LL BE RIGHT BACK, OK? BUT I HAVE WHAT I LIKE TO CALL INNER FOCUS . SO IT'S NOT LIKE I'M NOT PAYING ATTENTION, Y'KNOW? 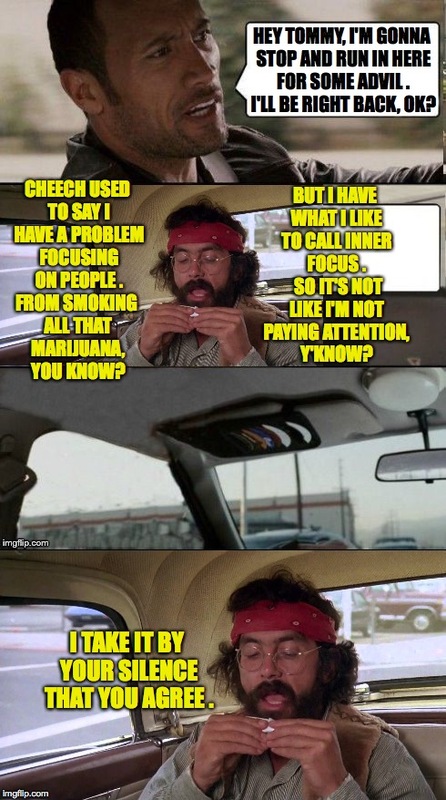 CHEECH USED TO SAY I HAVE A PROBLEM FOCUSING ON PEOPLE . FROM SMOKING ALL THAT MARIJUANA, YOU KNOW? I TAKE IT BY YOUR SILENCE THAT YOU AGREE .